NEARLY COMPLETE, RARE MIKIPHONE REPRODUCER. NICE UNTESETED CONDITION! GOOD NICKEL FINISH! Originale alte Grammophon Nadeldose (mit Inhalt). Look closely at the pictures,what you see is what you get! 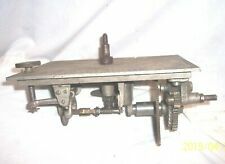 HERE IS A ZONOPHONE DISC PHONOGRAPH BEDPLATE AND PARTS. Vintage & 100% authentic! Looks to be in GREAT shape, selling as UNTESTED, just been sitting in storage for years! Really don’t know how to work it, which is the only reason we’re selling it as untested! Only thing missing is the big horn piece! Comes with & exactly as you see pictured! 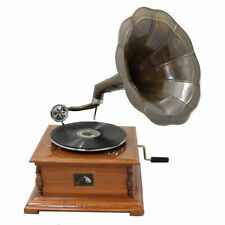 Edison Home Phonograph Combination Cylinder Record Player Plays & Sounds Great. Includes four cylinders all in good condition. Condition is Used. Shipped with USPS Priority Mail Package. BUT, ALSO HAS. GERMANY UNDER THE MICA AS WELL. INTERESTING SET UP! NICE REPRODUCER, THAT LOOKS READY TO USE! I HAVE OTHER PHONO STUFF LISTED! 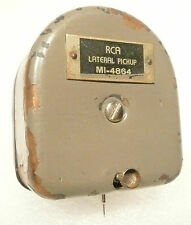 MARSCHALL Gramophone Needles Tin 1950 Phono Nadeldosen. Rare lot of 3 advertising MARSCHALL gramophone needles tins, 1950s, “ 100 Marschall Golden Needles” ( empty), “ 100 Marschall Langspiel Nadeln” ( full), “ Marschall Piano” ( empty). Four British needle tins, comprising two Embassy, a Songster, and a Leading Always. This is the last round of needle tins, boxes, etc. This is the last round of needle tins, boxes, etc. Originale alte Grammophon Nadeldose (ohne Inhalt). This is a needle box by HMV of London. It was released in 1920. These are fairly scare. This is the last round of needle tins, boxes, etc. Looking at a beautiful piece of history here: 1901 Columbia Disc Graphophone Phonograph with Red Morning Glory. Was serviced last year and in working order. Morning glory can be screwed off for ease of storage. HERE IS A TALK O PHONE OR A ?. DISC PHONOGRAPH CASE AND MOTOR. ONE MOTOR MOUNT IS LOOSE BUT IN BOTTOM OF THE CABINET. A NICE START HERE TO MAKE A DISC MACHINE OUT OF ODDS AND ENDS PARTS. Vintage Edison Cylinder Standard Phonograph 2/4 Min GEAR COVER - ORIGINAL PAINT! It is in excellent condition, and still has the original paint and gold pin striping. Here is a phonograph record that rarely turns up. Very little is known about this record. These records must be played on a phonograph that plays a vertically modulated groove which was not compatible with most of the machines such as Victor, Columbia, etc which used a lateral cut process. Lot of 14 vintage Edison Wax Cylinder Phonograph Record, 1 Columbia Co. 15 Total. Condition is Used and untested , conditions vary as seen in pics. Please see pics for conditions. 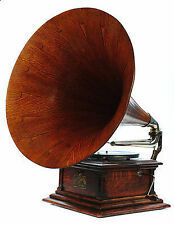 EXTERNAL HORN, PYGMOMALL, GERMAN MADE, GRAMOPHONE FROM THE EARLY 1900s! IT'S 100% COMPLETE AND WORKING! REFERRED TO AS THE "LUNCH BOX" MODEL, THIS IS A TERRIFIC LOOKING MACHINE! SUPER FAUX REPTILE FINISH ORIGINAL PAINT! ALL 100% ORIGINAL. PERFECT WORKING ORDER. RECENTLY SERVICED BY PROFESSIONAL TEAM. This is an "His Favorite Song" triangular needle tin. 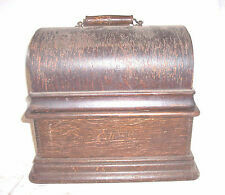 HMV Gramophone Gramaphone Phonograph 78 rpm Sound Box. SOUND BOX NEEDLES. UNSURE WHAT MACHINE THIS LARGER REPRODUCER FITS! HAS A PIVOTING ELBOW ON THE BACKSIDE! LOOKS TO BE COMPLETE AND UNBROKEN! 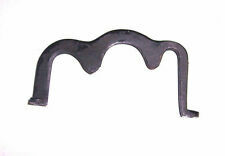 INTERESTING NEEDLE CARRIAGE! I HAVE MORE PHONOGRAPH STUFF LISTED TOO! Four British needle tins, comprising a Columbia, a Woodfield's, a Clear Tone, and one from the late Ruth Lambert, a well know (and loved) Needle Tin collector. This is the last round of needle tins, boxes, etc. This is a cardboard thee-section Victor Needles box, with sections for "Victor" "Fibre" and "Half Tone" needles and used. On the base is a label for Will A. Young, Ft. Wayne Indiana. This is the last round of needle tins, boxes, etc. This is a 500 needle tin for Knight-Campbell of Denver and other towns. RCA Victor record demonstrator with single and album size platens, mono tube amplifier. This is an Heart-Needles triangular needle tin. Edison Amberola Model DX cylinder Phonograph SN#21768 Plays & Sounds Great. Comes with three cylinders all in good condition. Condition is Used. Shipped with USPS Priority Mail .